They’ve also played better against teams that are off to good starts this season, and have been sub-par against those that haven’t started out so well. “That’s a reward, definitely, after the work we’ve put in the last couple weeks,” Ducks captain Ryan Getzlaf said. “He was a difference maker, for sure,” Ducks coach Randy Carlyle said. Nino Niederreiter ended a 27-game goalless streak with a power-play score to tie the game 1-1 late in the first period. Zach Parise assisted on Niederreiter’s goal and scored in the second period to break the tie and earn the 700th point of his NHL career. “It’s always nice when you get to the milestones,” he told Fox Sports North. It will be Stalock’s fourth start this season. So far, he’s faced the top team in the Eastern Conference (a 5-4 overtime win against the Tampa Bay Lightning), the top team in the West (a 4-2 loss to the Nashville Predators) and, most recently, made 34 saves in a 4-3 win at the Edmonton Oilers on Oct. 30. Stalock’s only two appearances against the Ducks came with the San Jose Sharks during the 2013-14 season. Both came in relief of Antti Niemi. 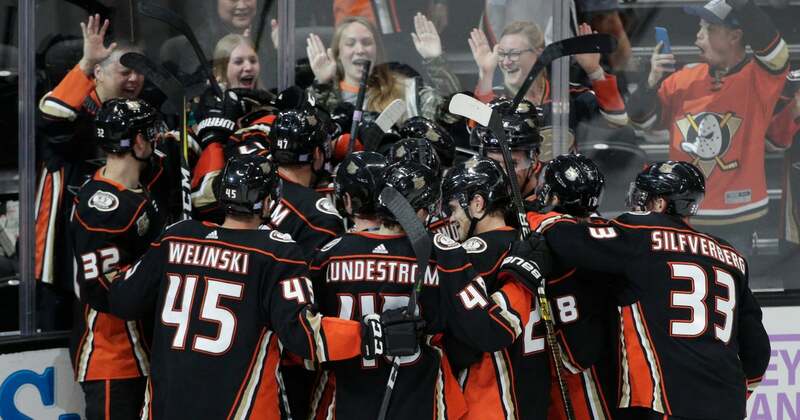 Fowler had his first career hat trick in a 3-2 overtime victory against the visiting Columbus Blue Jackets on Sunday, ending Anaheim’s seven-game losing streak — one shy of the team record.